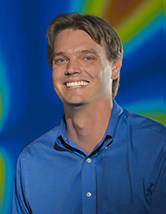 Professor Dustin Froula received his MS and PhD degrees in Physics from the University of California at Davis in 2000 and 2002 respectively. After working as a research scientist in the National Ignition Facility Inertial Confinement Fusion Directorate, at the Lawrence Livermore National Laboratory (2002-2010), he spent a year on sabbatical at the University of California at Los Angeles where he completed the second edition of the book, "Plasma Scattering of Electromagnetic Radiation: Theory and Measurement Techniques." He then joined the research staff at the Laboratory for Laser Energetics (LLE) as a Senior Scientist before becoming the Plasma and Ultrafast Physics group leader in 2011. He received a secondary appointment as an Assistant Professor in the Physics and Astronomy Department in 2013. In 2007, he received the Department of Energy's Outstanding Mentor Award for his work with undergraduate and graduate students. He was selected as a fellow of the American Physical Society in 2017 for the development and application of Thomson scattering to understand thermal transport and the onset of laser-plasma instabilities in indirect and direct-drive fusion experiments. Professor Froula's research interests are in the fields of Experimental Plasma and Laser Physics. His research covers the many areas relevant to inertial confinement fusion (ICF) and high energy density physics. This includes laser-plasma interactions (Stimulated Brillouin, Raman scattering, two-plasmon decay, cross-beam energy transfer), under-dense hydrodynamics, Thomson scattering, laser-plasma acceleration (wakefield acceleration), and short-pulse Raman amplification. His research is currently primary focused around the OMEGA, OMEGA EP, MTW, OPAL laser facilities at the Laboratory for Laser Energetics and the Jupiter Laser Facility and National Ignition Facility at the Lawrence Livermore National Laboratory.